We purposely held back our Friday post this week as the on line auction for Otis (try saying that with a mouthful of mashed potatoes!) closed last night and we thought, seeing as how so many of you had taken up Farm Girl’s “Sell! Sell! Sell!” mantra, you deserved to hear the outcome. During the course of our week, much of the tea table conversation had revolved around the future of Mr Otis and many different scenarios were explored. What if no one bid on him? What say the person that bid wasn’t “suitable”? What if…what if…what if… So many uncertainties! Turns out, our concerns were unfounded. Otis has landed well and truly on all four of his dapper little goat-boy hooves as it turns out, and is bound, on weaning, to take up residence on a life style block on the outskirts of Christchurch where he will have pigs, cows, sheep and (oh joy unbounded) a goatie friend called Brea to keep him company. How do we know the auction winner, George, is legit? We guess you can never know for sure, but as he invited us out to inspect his property if we so desire that goes a long way to dispelling our fears. Well, that and a quick search of his Trade Me profile (100% positive feedback) which shows his last two auction wins as a muck-spreader and new radials for a truck; sounds like real-life, down-on-the-farm, country folk to us. So, now the clock is ticking and in a little over three weeks, young Otis will be leaving the Homestead. Typically, in the last couple of days he has become astutely aware of (to the point of having a little wail at the gate) his mother disappearing through to the milking stand each morning. It’s all very reminiscent of tearful kindergarten partings the world over. Not that Geraldine cares. In her world, as long as there is the promise of a tasty morsel she’s up for anything. Appear at the gate mid kid-milk-top-up, clutching something that could possibly be ingested (she took off with the goat herd’s gardening gloves earlier today), and the off-spring are unceremoniously booted out of the way in her haste to be first in the chow-line. Actually, that ruck-and-maul thing she’s perfected would have any self respecting rugby ref reaching for his red card and had us feeling a tad defeated until recently. How, we asked each other, can we possibly expect to reap any kind of return (we’re talking dairy, here) if the lady kicks her own babies away from her udder? It turns out the answer was embarrassingly obvious; we bribe her with the very thing her world revolves around. After three days of removing her food every time she executes a swift high kick we have managed to remain unscathed and gather our first tidbit of white gold. Only a little, but all given happily, freely and without sustaining injuring for either party; a signal the battle is over. Let the good times roll! The celebration dance was both ungainly and undignified but the relief was heart-felt. With the kids getting older, their antics get more adventurous. Otis’s gate-bawling sessions last only as long as it takes for Ruby to remind him of their latest game: conquering Mount Goat Chalet. 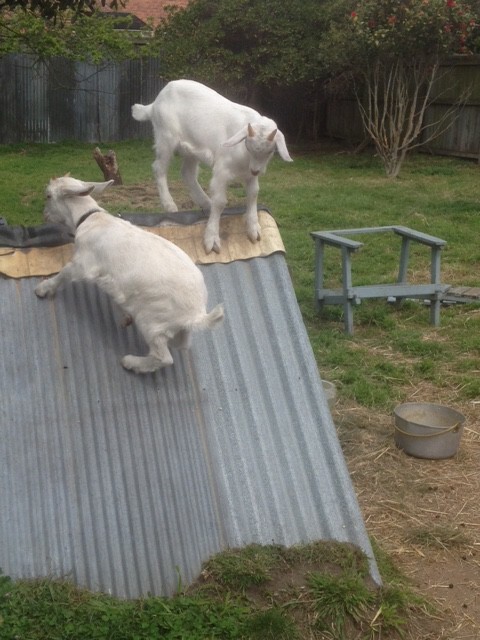 Thankfully all goat paddock neighbours, drawn by the clatter of hooves on roofing iron, forget their irritation at having their weekend sleep-ins interrupted when they clap eyes on the two of them. Their joy at the game is reflected in the grins on the audiences faces and, if it’s cost us a few boxes of eggs, it’s all in line with being neighbourly. All in all, this week has been very productive. The first week of the two-week term break, the difference not having to fit the lunch-box filling/school rush into our morning is total luxury. The morning chores can unfold in a meandering manner and, as there are a couple more hands on deck (The Renovator is also enjoying some off-campus time), we’re ripping through the tasks. The back gardens are now weeded and awaiting the seedlings building up their strength in the newly cleaned out and desnailed glasshouse, The Farmer’s bedroom renovations now await a visit from Pop and Uncle Trevor, and the mending pile is markedly diminished. In our unplanned, helter-skelter way of doing things, we even purchased a couple of hazelnut plants and a fig tree and have now had the time to work out where to put them! The Farmer took more than a passing interest in the nut tree purchase; nutella is his idea of heaven. Personally, we don’t think Ferrero need to worry just yet. The trees are but a metre tall tops. And all this activity takes place to the soundtrack of Farm Girl’s complicated, convoluted story-games. We doubt Mr Otis will be bragging about this to his new family, but there’s nothing the boy enjoys more, after a spirited game of mountaineering, than being tucked up under his “nine patch quilt” in his trampoline crib, playing Baby Carrie to Farm Girl’s Laura Ingalls. 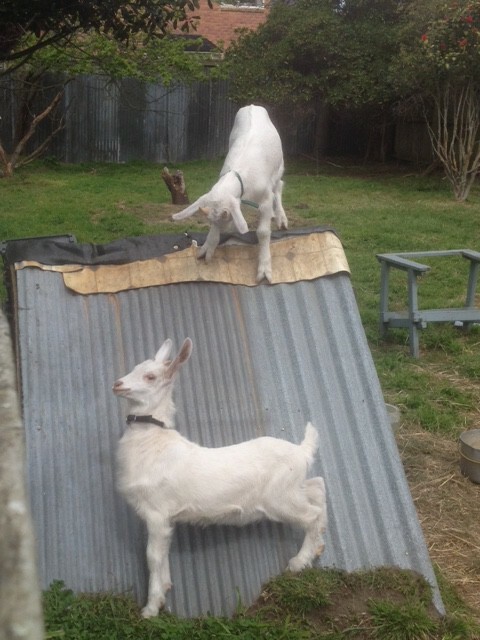 This entry was posted in Goats, Union Homestead and tagged Aotearoa, capering, Christchurch, farm, farmlet, farmstead, fun, Goat, goats, Homestead, Homesteader, kids, Laura Ingalls-Wilder, lifestyle block, Little House on the Prairie, milking, New Brighton, New Zealand, Otautahi, PIRNB, small holding, smallholder, smallholding, urban farm, urban farming. Bookmark the permalink. Glad Otis has found a satisfactory new home, you must be relieved. Very much so. The other option would have been very difficult to follow through! You folks are incredibly courageous for letting him go — even if it is to an excellent home. 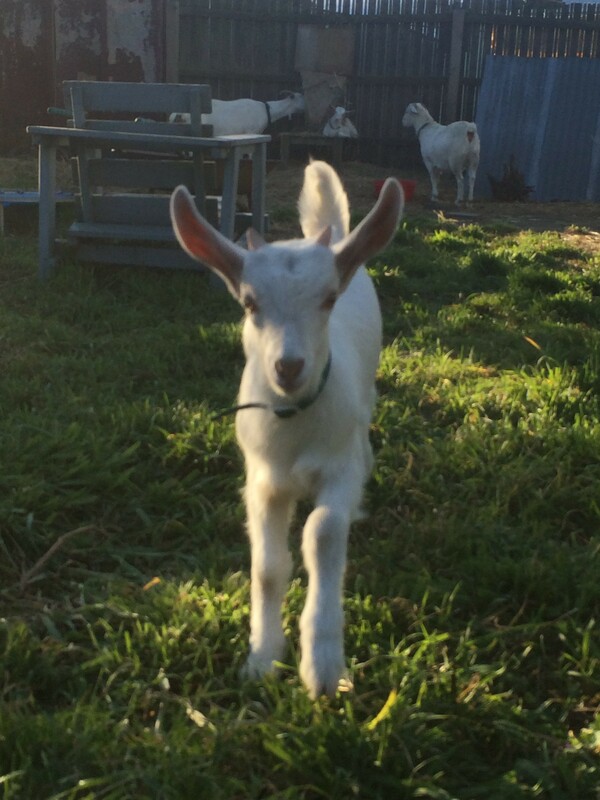 What an adorable little goat he is! He is absolutely gorgeous and very laid back, but we simply don’t have room for him and we couldn’t be happier with where he’s heading. It will be a very sad day when finally goes, though. Woohoo, a good home for Otis! Farm Girl’s mantra worked well. You must all be relieved. Now I am going practise Online-Auction-for-Otis with my mouth full and see if my English pronunciation improves and contemplate heaven and nutella. My Sunday is filled…have a lovely one yourselfs! Good stuff. This year we got our chickens. Vanessa says next year, it’s a goat. I’m good with that. Best of luck this season! 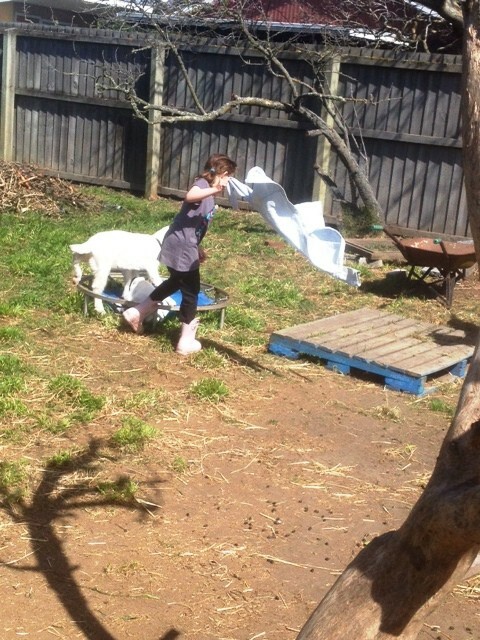 We say get two goats…they love company and two are infinitely easier to look after than one as they keep each other company and also quiet (a huge consideration here in suburbia). Thanks for your best wishes; we only hope for half your success. This year rocked for you’all! I am glad that it worked out well. It takes practice like everything else no doubt. Yay! The mantra worked! Congratulations, and I’m sure Otis is going to enjoy life at his future new home…chances are excellent that he will outgrow his enjoyment of the role of Carrie from Little House, so it sounds like things are working out well all the way round. Ah, nutella. I keep finding recipes for it in all the cookbooks I’ve begun bringing home from the library – I’ve got one book out now, called “The Kitchen Pantry Cookbook” by Erin Coopey, and there is a recipe for chocolate hazelnut spread that involves 2/3 c of toasted hazelnuts and 1/3 c toasted almonds (there’s almonds in nutella? really?). I won’t be trying that with homegrown hazelnuts anytime soon – I think I got three this year before the squirrel got to them. He won on the walnuts too. You lot have been incredibly busy, and got such a lot done. I know there’s probably tons still to do, but still – what a good start. Luckily we haven’t got squirrels here, so hopefully that problem doesn’t occur here -we have to sort as it is. I’d never considered goats not wanting to be milked, but then our nativity about all things rural is frightening. Loved Edwardian Farm – the kids think the similarities between Ruth and myself are a tad scary at time…esp the cackle. We may have been busy, but as you say we’ve barely made a dent in the pile of work to do! Hope things are more sedate for you. No squirrels? You are so lucky. On the other hand you have possums. Our tour guide (who grew up on a farm outside Christchurch) used to get the whole coach chanting whenever we saw roadkill – “the only good possum is a dead possum”…and then we got to Australia, and discovered they’re protected over there. Go figure.